NOTED MC SHANE Ross left with a mic drop. “It’s the beginning of the end for the old FAI”, said Ross as he left today’s Oireachtas Committee on Sport early to go and vote on an aircraft noise bill. For all the noise made in Committee Room 4 today, the significance lay in words quietly read outside in the lobby. Just after 1pm it was revealed that the FAI’s auditors Deloitte had reported to the Companies Registries Office, claiming that the FAI’s accounts had not been properly kept. Once Committee proceedings kicked off, we did learn some bits and pieces. Sport Ireland had to tell us it is their understanding that John Delaney remains on the FAI’s payroll, and Chairman Kieran Mulvey drew on his extensive knowledge of employment law to venture his opinion that Delaney is currently on gardening leave. It was also another outstanding day’s advertising for the good folk of Mazars, who have poked their nose above a welter of reviews, reports, and investigations. Let’s call this bit Auditception. Mazars are conducting an independent investigation into the FAI, and the terms of reference for it will be agreed with Sport Ireland and the Office for the Director of Corporate Enforcement. That investigation is going to go on for quite a while, and it is set to have a pretty wide remit: Sport Ireland say it is set to include a look into credit card spending and third-party transactions. When is it likely to land? John Treacy said it would be a while, although there may be an interim report in six to eight weeks. Meanwhile, Sport Ireland are going to conduct their own audit of the FAI, which will be as “extensive” as they need it to be. They put that audit out to tender a few weeks ago but couldn’t find anyone actually willing to do it. It may be a case that every available auditor is currently busy auditing the FAI. Meanwhile, the sidelined stars of last week’s Committee Grant Thornton did get one mention: their review of the Association’s books is ongoing, and Sport Ireland say Grant Thornton have secured all the documentation they need. While all of this is going on, Sport Ireland are also working with the FAI on our new friend, Good Corporate Governance. This is what John Treacy says is most pressing: they and the FAI have formed a(nother) sub-committee, this time a Governance review group, the majority of which will be made up of independent members. Sport Ireland have nominated a chairman for that group: Aidan Horan of the Institute of Public Administration. While some of the Committee called for the FAI Board to step down immediately and an interim Board be appointed, Treacy is eager to work with those in situ now to address the governance issues as quickly as possible. All of this carries with it a considerable caveat: Sport Ireland can do nothing to prevent the same Board members that step down running for re-election as they can’t make the restoration of funding contingent on certain people stepping aside. 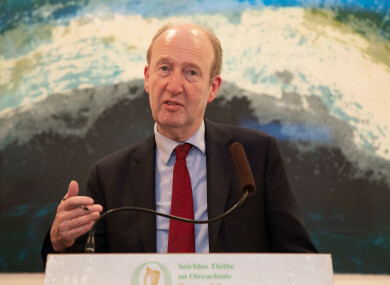 Shane Ross, however, says it is “imperative” they step down, and while unhappy that they haven’t gone already, he’s glad to have a commitment that they will leave. “We’ve learned that a commitment from the FAI doesn’t mean an awful lot”, remarked Ruth Coppinger. What looks sure at this stage is that funding will not be restored for quite a while. Shane Ross offered his vision for the future of the FAI, calling for a “stakeholders forum” as a way of bringing ex-players and supporters onto the Board. Perhaps we’ll soon see a ‘Davy Keogh Says The FAI Does Not Wish To Comment At This Time’ banner hanging from an Abbottstown window. Other than that, the FAI once again took a very public kicking. There were various unflattering comparisons drawn with the artist formerly known as the OCI, with Treacy saying that both organisations have had a poor balance of power. “The Board directs and controls the organisation and the CEO implements it. It is clear that balance was wrong in the FAI and the OCI”, said Treacy. The FAI’s now-legendary regard for the witholding of information came to the fore once again, as it turned out they neglected to tell Sport Ireland at a meeting last night that their auditors Deloitte had registered a complaint with the Companies Registration Office. Treacy also assured Committee members that Sport Ireland would make clear their unhappiness to the FAI if they weren’t watching proceedings. “Oh they’re watching”, replied Jonathan O’Brien. Perhaps they were, or perhaps they just couldn’t stomach it. An extraordinary day; one that left whatever shreds of dignity or credibility the FAI had left dancing away in the wind. Those winds, meanwhile, are soon going to gather the momentum of – to misquote a friendly man – the mother of all storms. Email “'The beginning of the end for the old FAI'- Dramatic day sends crisis-hit Association into endgame”. Feedback on “'The beginning of the end for the old FAI'- Dramatic day sends crisis-hit Association into endgame”.